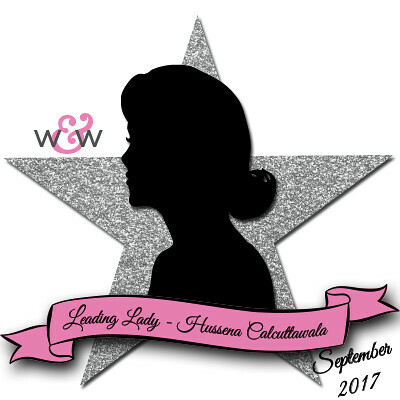 Our September Leading Lady, Hussena Calcuttawala is back for her sensational second performance! If you missed her smashing debut you must see it...CLICK HERE. Today's duet of cards are a celebration of bright, vibrant happy color! I am back for my second post at the w & w blog. Today I will be sharing cards I made using products from the new August release. To make this card, I stamped and die-cut some flowers and leaves from the In Bloom: Shirley's Blooms stamp and die set. For the flowers, I have used two different colored dye inks for contrast between the inner and the outer petal. I also did some pencil shading using Prismas on the centres of the flowers. I stamped the polka dot circles using stamps from the Ring in the Celebration set. I then die-cut the buds using the dies from In Bloom: Shirley's Blooms Cutaways. To die-cut the frame, I first stamped the scalloped circle with Versafine Onyx Black ink and then die-cut it out using the coordinating dies from the Ring in the Celebration Cutaways. I also die-cut a card panel using the largest rectangle scalloped frame die from the Essentials: Audrey Cutaways set. 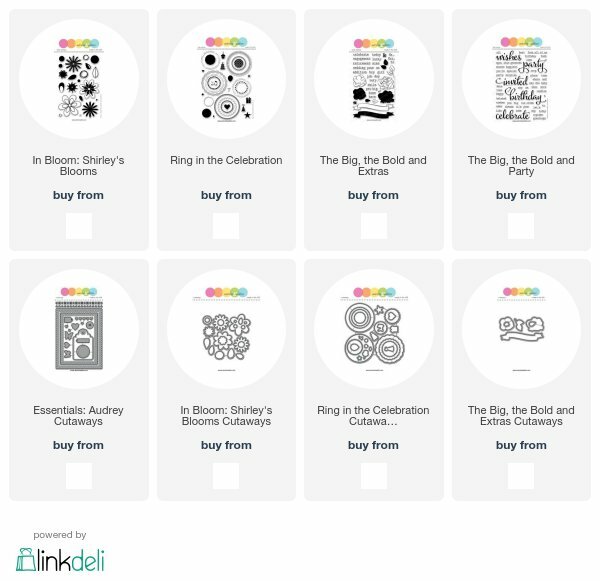 My background was created by randomly stamping the black rings from the Shirley's Blooms set. I also colored in these rings using Prismacolor pencils. Finally I popped the flowers and leaves on foam dots. The sentiment is from an older set - The Big, the Bold and You. I decided to work with some soft colours. I started by stamping my card panel with three tiny images from the Ring in the Celebration set. I used different shades of dye inks to stamp them. The little cake in the centre of the card was stamped and die cut using the coordinating die from the same set. I also added two more stamped and die-cut circle frames, one with a sentiment around it and one a decorative frame. Both were popped on foam dots. The ribbon banner and the sentiment is again from a old set - The Big, the Bold and Extras. I finished off the card by adding a little bit of Clear Stickles to the stars, the cake and the centre of the gift bows. I love how this came together really quick - the set is perfect for making birthday cards and pretty tags which I shall be sharing in my next post. The Ring in the Celebration set is really very versatile and I'm definitely going to be reaching for it soon. I hope you liked my cards and are inspired to create your own. I would love to hear what you think of them. Don't forget to comment on my blog post for a chance to win the $30 gift certificate to the Winnie & Walter store. Winner will be announced on my blog, at the end of the month. Wow! Such beautiful creations! Love the pretty blooms on first one and the Birthday one is so cute in soft color! Bright n colorful beauties ! Your cards are lovely. The colors you chose are perfect. I'm adding the Ring in the Celebration set to my wish list. 2 great cards, but the floral one stole my heart! Pretty cards! Love the Ring in the Celebration set... lots of possibilities! Ooh, I love the layers and that cut out in the center for the birthday card! This looks like a really versatile set! Sweet!!! The colors are amazing!!!! I love these beautiful, bright cards! The floral one is my favorite! Very pretty card designs and colors. Love the cheerful colours of your cards and how you used the tiny images for the background of the second card! Hussena both of your cards are fabulous ... LOve those blooms - and don't we wish they grew with polka dot leaves in real life? I do! Beautiful cards! I love how colorful they are. This is a great job, these cards are lovely !! Wow! Both of your cards are adorable!!! So pretty!! Love these bright and cheery cards. Great use of the new stamps! So gorgeous with those bright colors and pretty design. Thanks for sharing! These cards are so colourful and elegant - love them!